I was always skeptical of warm salads, but I really, really enjoyed this one. 1. Wash and prepare all the vegetables. 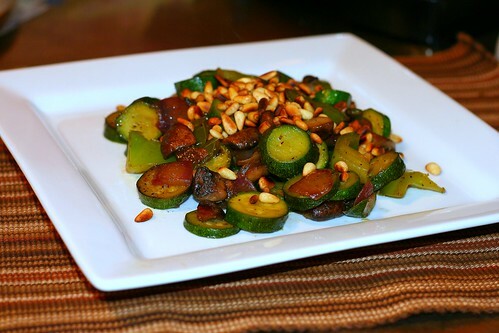 Cut the zucchini in circles, the bell peppers and onion in large squares and the bella mushrooms in large chunks. 2. Preheat a nonstick pan with the 2 tbsp sesame oil. Sautee the onion until golden in color, then add the bell peppers and and mushrooms. 3. 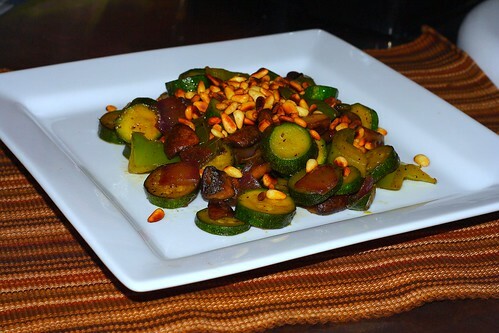 When the mushrooms release their juices add the zucchini and stir fry with the lemon juice, salt and black pepper. Remember that when you serve the salad the zucchini have to be still crunchy, not boiled and mushy! Set aside. 4. In a dry pan roast the pine nuts until they release their flavor. You can add them to the salad immediately, because it's a warm salad. * If you make fresh salad with pine nuts, you have to let them cool completely after roasting before adding them to the salad. I freaking loved this dish! Treated it more like a stir fry, but left the zucchini a little hard like you suggested, and added some fresh spring onions and a little chilli. Served it with quinoa - superb!